Hi guys, time for some green nails! :-) This week I had a party for which I did simple, stunning, silver glitter nails to match my red dress. I used China Glaze Millenium and a coat of Silver Lining on top, also from China Glaze. I didn't have an idea for my forth challenge yet at the time, but when I saw the dense silver glitter sparkle on my fingertips I just couldn't wait to combine it with a bright green. So the next day I made these V-gaps with Barry M's Spring Green. I love, love, love the color. It's so vibrant! Almost like a neon. I didn't manage to capture its true color in the pictures though, where it looks a bit turquoise. In real life it's more like a Hulk-green, wild and strong. ^^ What do you think of today's green nails? Beautiful! That green is gorgeous! 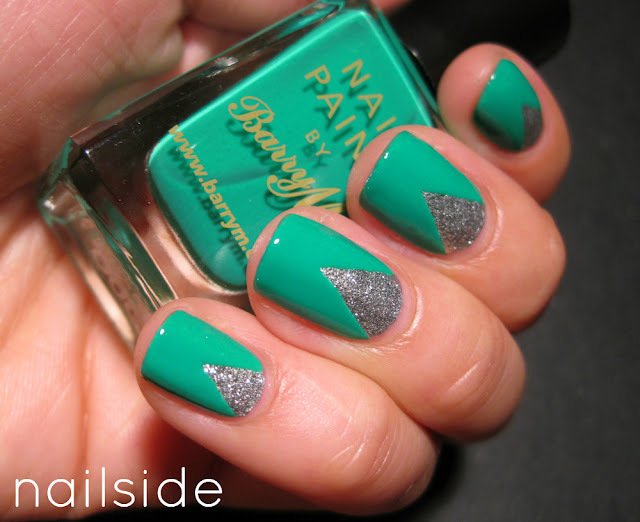 I love this green with silver glitter polish! :) Nice combo! I love these colors together! That green is wicked. Actually I do it both ways, but I prefer the way you do it. It just depends on which color I'm wearing as my basecolor. In this case I happened to be wearing the silver glitter that I wanted to be the V-gaps, but otherwise I would've done it with two seperate pieces tape because it's easier that way. ^^ The tape attaches better to the round shape of my nails and also the layering polish won't seep under the tape so easily that way. I admit it can be hard to determine where the strips should go for an even triangle. Perhaps you could make a tiny dot on the basecolor with a toothpick so you'll know where the point of the V comes. I just came up with it now, but I should try that muself too, haha. Good luck! I love greens like this! And I just love silver glitter with neon in general. Lovely nail-art. Love the color of Barry M! This combo. Girl, you are such an inspiration! They are extremely gorgeous, sassy and elegant all at the same time! LOVE! How do you do it? You always seem to find the perfect combinations! I love that green with the silver and the design is totally awesome! You always do such a great job. It is truly inspirational! Some months ago, I participated of a challenge of this. Really fun, you know, but 31 manicures... it took a loooong time to me to accomplish it. This green polish is elegant and daring, I have something similar. Cute! I love how neat your manis are!! I love this. I also wanted to say that I admire your blog and find it inspirational. Oh my gosh, that colour is just perfect! And yaaay! I'm so glad that you are one of the blogs without that hideous, time-consuming, awful CAPTCHA. Thank you for that :) . I like that you add a little design. It's super cute! Such great colours, I wish I could get my triangles to look as good! I love your designs and this one is amazing. This green is absolutely amazing!